A compact travel guide for Uruguay. The country's attractions, things to see, shopping places, cuisine and accommodation options are listed. The Oriental Republic of Uruguay is a small country located between Brazil and Argentina. However, it has distinct personality compared to their "bigger brothers" and those visiting Uruguay will be able to see its unique landscapes, attractive destinations and feel the warmth of its people. It is a plain territory, without high mountains. Its highest point is only 514 meters high and the Cerro Cathedral is just one of the attractions to see when visiting Uruguay. In its little territory the tourists can enjoy unrivaled beaches on Costa de Oro (Gold Coast), Punta del Este and Rocha, hot springs in Paysandu and Salto, history in Colonia and Montevideo, the mountains in Minas and also hunting and fishing throughout the country. For accommodation you will have a wide range of options from luxurious hotels to hostels and budget hotels. You can easily rent a car, but you can also use the extensive network of roads with a wide transport services throughout the country. The climate is mild, with average temperatures in the South and somewhat warmer in the North. The sun dominates throughout the year. Uruguay, whose capital city is Montevideo, is located in south eastern part of South America. On the west border of the country there is Argentina, on the north and east border of the country there is Brazil, and on the south and on the southeast border there is Atlantic Ocean. In this fascinating country, you will have many attractive options to enjoy your stay. Surely your personal tastes guide you from these suggestions. 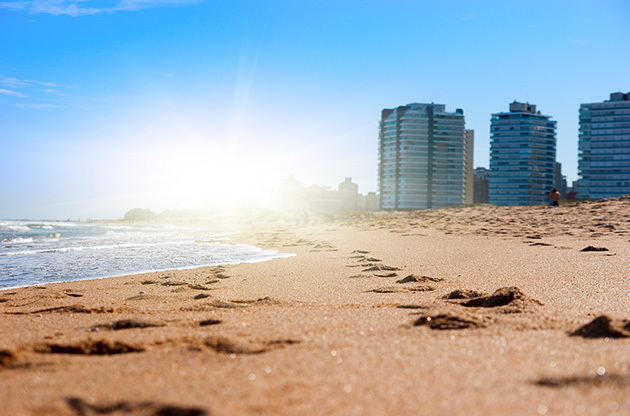 The most important Uruguayan and South American resort Punta del Este has luxurious hotels, a magnificent harbor, a great nightlife, plenty of gastronomic options and unrivaled beaches. If you do not want to be regretful, try not to miss it. Paysandu and Salto concentrate thermal complexes: Guaviyu, Almiron, Arapey and Dayman. All of them offer pure water emerging from the rock, with therapeutic properties. If you are looking for relaxation and enjoyment, there are plenty of fascinating landscapes around. It is a unique dune system in Uruguay and is one of the few areas of mainland dunes in the continent. It is located in Rocha and is known for its rugged appearance. Recognized by UNESCO as a World Heritage, it maintains a historical record of the period of the Conquest, with cobblestone streets, witness of battles and invasions. It will definitely be a unique experience. A visit that no tourist can miss when visiting Uruguay should be to estancias (ranches). The countryside and its inhabitants, known as gauchos, are part of the national tradition. The fogón (bonfire), sharing a mate (the national drink, a kind of herbal tea) and eating a nice piece of lamb on a tough piece of bread for breakfast will give you the chance to know this rural life better. Eastern Wetlands, declared as a World Biosphere Reserve and known for its marshes and palm as well as over 400 bird species, are also attractive places like the Eden Valley, the Gorge of the Crows and Penitent Leap. Visiting Uruguay allows great shopping opportunities, both traditional and the world's leading brands. Shopping malls are highly attractive but do not hesitate and always be prepared to be tempted by small shops where you will find many surprises. The grilling can be regarded as the traditional cooking style in Uruguay and variety is really fascinating. In general, the restaurants cook their meat in front of the customers, which draws attention appetizes the customers. However, there are many different culinary options to choose from. You will be able to find what you like better, from pizza to sushi through cuisine specialties from all continents. It will be beneficial to check whether you need a visa or not before your arrival to Uruguay since the visa procedure may differ according to each country's regulations. Thanks to its beautiful nature, growing economy and the richness of social and cultural activities, Uruguay remains as an attractive destination for global events like trade shows, fairs, exhibitions, congresses, conferences, summits and many more. Competitive hotels with world class facilities, high capacity venues that are fully equipped with the latest technologies help Uruguay host remarkable international meetings each year and draw worldwide attention to the country. Many delegates from all around the world come to Uruguay each year for these sector leading events.